The small apartment with two bedrooms for a young family is situated near the South Park in the upper part of the Lozenetz quarter in Sofia. Its orientation is southeastern. The windows take up the whole facade and have floor-to-ceiling height, typical for an office building. In the living room they reveal a great vista along a small local street on one side and on the other - a view towards the massive trees in front of the near-by residential building from the 70s. The main ideas during the design process were an overall strive for peacefulness and serenity on one hand and the ensurance of a high quality of life using distinct compositional elements and flexible functionality. 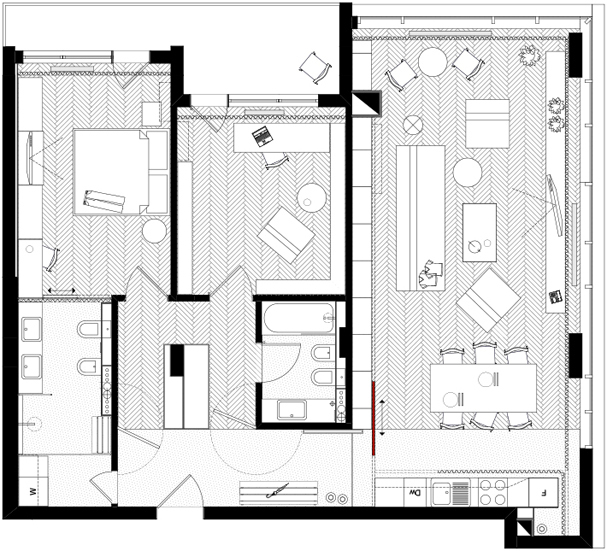 The intervention in the original floor plan consists of the removal of a couple of inner walls and the widening of the passage to the living room. The extended entrance hall transforms into a closet accessible from all sides, concealed by two revolving wall panels. When closed they are a natural continuation of the wall and when opened they reveal the passage to the two bedrooms. The flooring in the apartment – fish bone parquet and polished concrete – define the functional zones. The concrete coming from the hall continues in the living room, where it provides the necessary conditions for a kitchen. Concrete is used for the flooring of the two bathrooms as well. The general conception of the living room revolves around the organizing of each side by a single principal – an exaggerated bookshelf, a glass facade and a kitchen. A panel slides in front of the bookshelf and permits both the concealment of any part of it and the closure of the room. Along the periphery of the living room are situated white curtains that continue to the kitchen and cover it if needed. The parents’ bedroom and bath are visually fused by the use of glass screens and the continuation and conversion of the wardrobe into a high cabinet. The visual trajectory from the bedroom through the bath to the storage space is accomplished through the usage of two glass screens the second of which is frosted. The kids bedroom has underwent minimal interventions according to the owners’ will so that it could be easily transformed in the future.